Fortunately for us, we can always Compare It! Compare It! 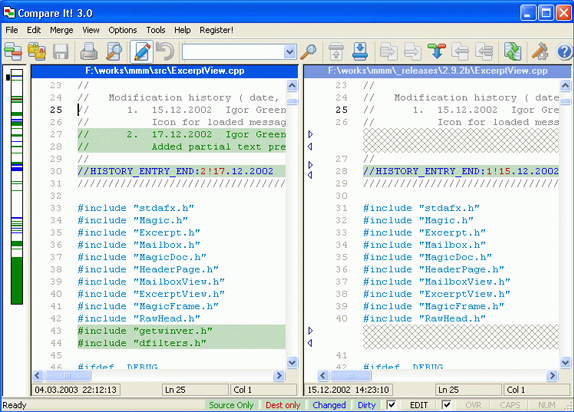 displays two files side-by-side, highlighting the differences between them in various colors. With just a glance, you'll be able to see and compare files while still retaining your eyesight. And with just a click or quick keystroke, you can merge changed files into a single consolidated document - with the safety of an auto-backup folder to boot! You can even use Compare It! to strip the XML tags from a file so you can compare XML to XML, or XML with text! Advanced users will appreciate the ability to edit files directly in the comparison windows. Plus, Compare It! 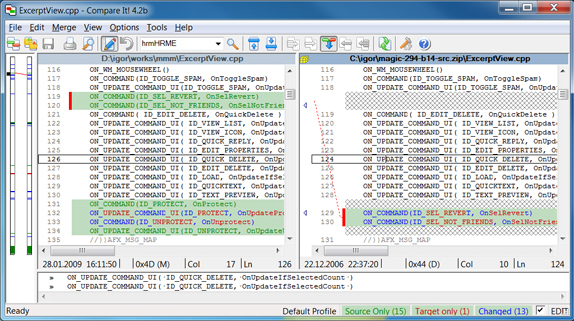 now lets you compare binary and image files! Even if you're wasting your life in middle management, Compare It! can ease the pain of your daily struggle by giving you an easy way to print out reports in full color, highlighting exactly the same differences as you see on the screen. You can even output the report as an HTML file! Your boss will be so pleased, you may even get a an acrylic paperweight with your name on it! 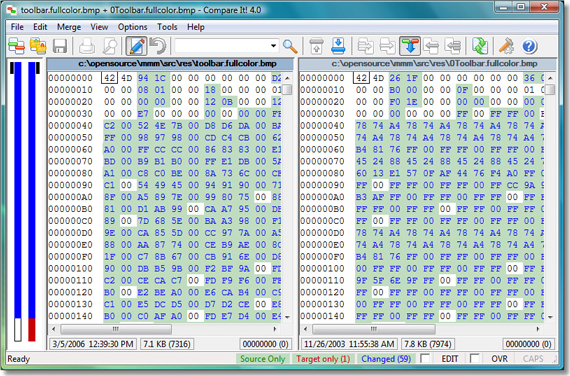 Additional viewers now allow comparisons between binary and image files. Merge changed files into a single document. Produce full color comparison reports and HTML-format output. Compare Microsoft Office files! Compare It! can quickly compare DOC, DOCX, XLS, and PDF files in read-only mode (editing and merging is not supported in this case). Overhauled editing engine means that true editing is possible from directly within comparison panes, with full support of mouse and keyboard operations, clipboard, bookmarks, and more. 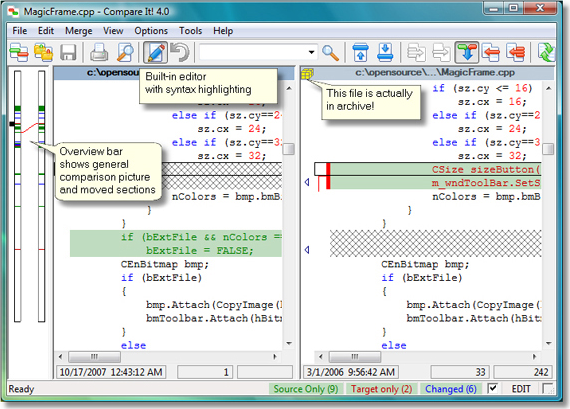 Syntax highlighting includes built-in support for C++, Java, C#, Delphi, HTML, and custom syntax files. Word wrapping within the editor panes means that you can easily see changes in long lines without having to scroll sideways. Zip archives support: transparently compare a file with it's zipped version! 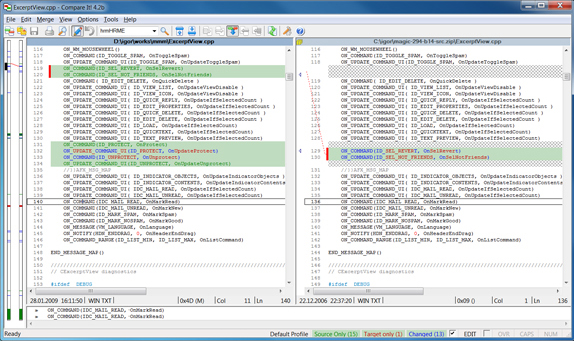 Detect and visualize moved sections in a fashion similar to WinDiff. Automatch rules allow you to simplify comparison of structured files by using key fields. After you purchase Compare It! it may be used indefinitely. Compare It! is licensed per user, so if more people are going to use Compare It! you will need to purchase additional copies. Support is provided up to when the next major version is released, and minor versions thereafter. my (almost) usual question: Why would I buy this software? I am the licensed owner of Scooter Software's "Beyond Compare" 3.x. What do I gain by using your software over the aforementioned one? P.S: Yes, I am lazy. I don't want to spend 'hours' to evaluate your software. Just buy it if there is a real use/advantage. Igor Green BC is very good, so if you are happy with it- these is probably no good reasons to change the tool you are used too. Lee Garber Hi I am looking for reliable comparison of pdf files even if the text in one pdf file is on a different page in the compared pdf file - how does this work on pdf's? We got Beyond Compare bundled with our version control tools. Almost all of our Engineers switched to CompareIt, because it just plainly works better. I'm trying to buy it, but the state selection is not appearing correctly when choosing the country as Brazil; may you fix this in order to complete the purchase? Lupke Brother Is there an offer available for the lifetime license? We have additional too for folders comparison, and same coupon works for bundle too. PDF comparison is difficult mainly because it's not always possible to extract text from it - it depends on generation routine. CompareIt extracts text from pdf, so it doesn't mater on which page it was originally. RCG I agree, a lifetime licence option would be good. Seems version 4 has been out quite a while - version 5 can't be long away. Mitch K I am a registered user of Compare-It and have been using it for a couple of years. It is really good software and works well. However, I do find it strange that there are never any updates to the software. I am using version 4.2.2221 and the copyright indicates 2009. Is this software still under active development? Will there ever be any updates to Compare-It? James Evans @ Igor: "same coupon works for bundle too." 1. So far, I have been unable to locate a link or invoice for the bundle. Can you help? 2. I too would be interested in the lifetime license. Is there a promo price on it today? -Can the license be transferred to another owned computer? -Is license activation required? If applicable, what is the process for requesting a transfer (e.g., automated or email). I have over 40 activated products on my system and upgrade frequently; I need pin down detail whenever I consider adding new programs. Software Guy Seems like a great deal for $9.57 as compare it! allows users to compare AND merge two different documents. the merge feature can come in very handy at times. Did notice that it is possible to add the lifetime license, or to add synchronize it! to the cart, but that the additional items added were not discounted. At any rate, great price for a nicely featured compare and merge utility. It's possible, but you have to use the coupon through the plimus payment on grig. Thank you, I have just setup plimus with same coupon. Igor Green And sorry for anyone - you might have problems with key generation on Plimus, but I will send you key with 24 hours. RCG Hi all, sorry to be a bit slow on the uptake here. Can I just check, is it possible somehow to get the lifetime licence with the 67% discount. I clicked through and saw how to add the lifetime licence option to the checkout but didn't know what voucher code to input. Thanks for any help. My perosnal opinnion (owning beyond compare and compare It): if you only will own one comparision tool I think beyond compare is by far the most versatile and best comparision utility for folder and file comparing. (didn´t find any other software being better(. Beyond Compare is under active development and the support always has been reliable. Nevertheless I myself decided to buy Compare It at last bdj offer.as an supplement to beyond compare. I think Compare It hassome advantages when e.g. comparing word and excel documents (beyond commpare only seems to convert them to plain text and the text that is shown in the comparison pane is not very coomfortable to read (tell me if I´m wrong and you mange to get the doc files been shown like an ordinary page): Commpare It seems to keep more of the original layout, so it is clearer to read: Best try yourself with a few excel and word documents. Beyond Compare has real image-comparison, compare it only side by side view. MANY thanks for this info! Look, 10$ is (almost) no money at all (I know, shame on us 1st world people). I'm going to buy just out of your detailed recommendation. This was what I asked the vendor for "What would 10$ gain me?" Give this H.H. a lifetime license, he just did /your/ job! Thank you for your order from share-it! We value you as a customer and look forward to serving you again in the near future. Below you will find specific information pertaining to your order. We have received your order. Please note your reference number, which is used to identify your order: REF# 415997235. Unfortunately, the PayPal transaction for your order 415997235 has been delayed. We will inform you as soon as we have received your payment. Whatever you do, THIS was not serious! Brenda Adams I own several compare programs, but Compare It! is the one I use the most often. One reason is, unlike some, the lines can be wrapped...which lets user see the entire line(s) without effort. Frank Sielna 3rd post, I know. But @Nick (of Bits): I do not appreciate having to change my login data to my payment provider after an order at BDJ. That's really not the idea of ordering here! Yudha Yan Kusuma Is it possible to add the lifetime license and synchronize it! to ShareIt cart? Brenda Adams I wish you would extend this offer. I have emailed my friends that they only have a few hours and I'm concerned they may not see the offer in time to buy at this great price. Please extend offer another day. Software Guy Sounds good because I would like the lifetime license too. Please tell us how to get it as it looks as though the deal expired. Thanks! RCG Hi, purchased this yesterday and still waiting to receive the key to use it. Any chance I will get it soon. Cheers. Igor Green RCG, Sure! Sorry for delay! Lee Garber Hi Igor - I bought Compare It on this promo and would really like a lifetime license (but did not know it was available at the time I bought it) - is there an email I can contact you on (maybe through your website) to discuss - Cheers! Igor Green Hello Lee Garber and others! I'm sorry , according to BDJ rules I can not make any additional actions with 2 weeks, so would you please contact me, I will me you personal offers after 2 weeks time.